The 2016 Energy Statistics Yearbook is the sixtieth issue in a series of annual compilations of internationally comparable statistics summarizing world energy trends, which commenced under the title World Energy Supplies in Selected Years, 1929-1950. Annual data for more than 200 countries and areas for the period 2013 to 2016 are presented on production, trade and consumption of energy for solid, liquid, and gaseous fuels, electricity, and heat. Per capita consumption series are also provided for all energy products. Graphs are included to illustrate historic trends and/or changes in composition of production and/or consumption of major energy products. Special tables of interest include: international trade tables for coal, crude oil and natural gas by partner countries; selected series of statistics on renewables and wastes; refinery distillation capacity; and a table on selected energy resources. 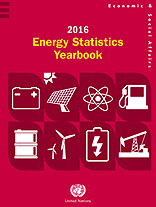 The Energy Statistics Yearbook is available in printed and electronic (PDF format) versions.